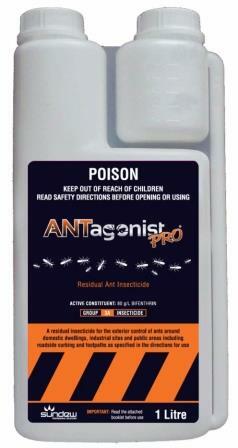 ANTagonistPRO is a suspension concentrate formulation containing a Polymer Enhanced Synthetic Pyrethroid approved for the treatment of ants, spiders, wasps, cockroaches, mosquitoes, midges, fleas, flies, ticks, termites and turf pests including lawn armyworms, sod webworms, argentine stem weevil, billbug, African black beetle, ants and oramental pest including mites, aphids, caterpillars, loopers, earworm, budworm, lightbrown apple moth, whitefly, mealybug, thrips and cutworms. Stable on alkaline surfaces eg. concrete, cement board, etc. Ideal around sensitive areas such as schools, day-care, where nuisance ants cause great distress.